Anthony Maria Gianelli was born in 1789 into a middle-class family living near Genoa in the north of Italy. As a child, people were often struck by his gentle nature, industriousness, and extraordinary intelligence. When he came of age, the lady who owned the farm his family lived on became his generous benefactress and financed his schooling and entry into the ecclesiastical seminary in Genoa. He quickly distinguished himself by his virtue and exceptional eloquence, thus earning him the unusual privilege of being allowed to preach while still a subdeacon. In 1812, when he was twenty-three years old, he was granted special dispensation to be ordained a priest two years before the required canonical age. Although Fr. Anthony was dedicated to his educational work, he also devoted himself to the work of preaching and hosting missions which resulted in a great harvest of souls. All this was in addition to all his ordinary duties and functions as a parish priest – indeed, he was often confined to his confessional for long stretches of time in order to accommodate the endless stream of penitents who flocked to him for spiritual aid. He was ordained a bishop in 1838 and appointed to the diocese of Bibbio, where he led his flock by his extraordinary example of virtue, prudence and firm government. Before his death from a fever in 1846, at the age of fifty-seven, Bishop Gianelli founded three religious orders - two for men and one for women. The Missionaries of St. Alphonsus and the Oblates of St. Alphonsus were established in 1827-1828; but sadly, both lasted only twenty years. The Sisters of Our Lady of the Garden were founded in 1829 and dedicated their lives to teaching poor children and caring for the ill and infirm. They are still active and well known today in Italy and in other parts of the world as well. 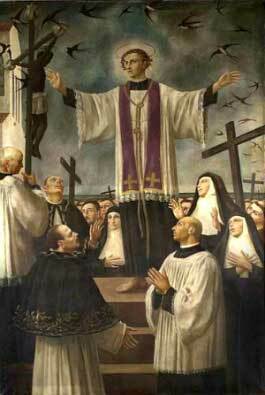 Anthony Gianelli was canonized in 1951 by Pope Pius XII.